Have you ever played a brilliant piece of music, taken a perfect golf swing, or given an inspiring speech .. when no one else was around? If your performance seems to suffer when you’re in front of an audience, you’re not alone. Nerves can get the better of just about anyone, said Jeff Nelsen, associate professor in the Indiana University Jacobs School of Music and hornist with international performance group Canadian Brass. Helping people transcend their fears is Nelsen’s specialty. He teaches seminars on “Fearlessness,” which he describes as “a mental state of complete faith in the moment at hand and any task ahead.” Feeling fearful detracts from your performance, he said, by causing you to focus on yourself rather than your mission. 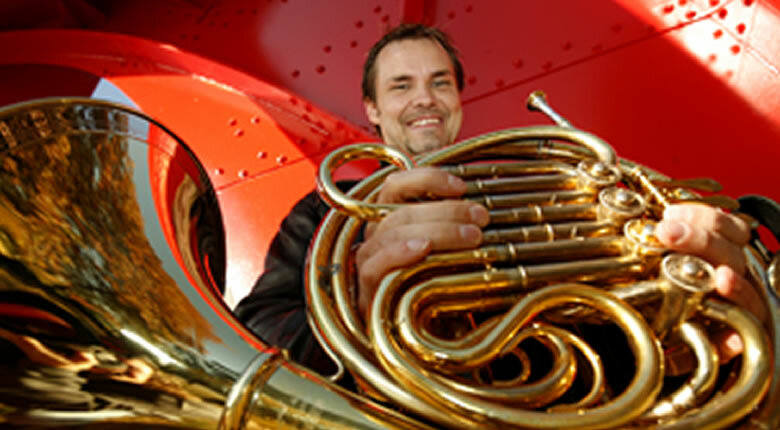 Jeff Nelsen, associate professor in the IU Jacobs School of Music and hornist with Canadian Brass, gives suggestions for achieving fearlessness. Instead, he said you need to literally lose yourself in the moment — forget about who you are and focus on what you want to achieve. But in order to make that happen, you first need to build the habits that will serve you when it comes time to share your talents. In celebration of a new year and new possibilities, we offer 10 tips from Nelsen on becoming fearless. Whether you perform on stage, on a playing field, or in a boardroom, you can use these methods to replace your nerves with a confident and optimistic outlook. For more information about his techniques, visit http://www.jeffnelsen.com. “Flawlessness” is not the primary goal. It’s important to minimize mistakes, but an error-free performance is not the ultimate test of your abilities, Nelsen said. “In my opinion, only a computer is flawless. What makes a performer good is that he or she is human, and brings to the art something more than what is written on the page. Otherwise computers would be doing all the recordings,” he said. The best performances are memorable not because they are perfect but because they are extraordinary. He tells the story of a performer trying out for the Montreal Symphony who, despite missing more notes than anyone else, won the audition. “The director told me that he made so much music that they couldn’t not hire him,” he said. Focus on what you want to convey, over and above the technical qualities of your performance, and trust your preparation to keep your errors to a minimum. Don’t compete. “When you compete, you lower your standards,” Nelsen said. “Was Mozart competing? Was Einstein competing?” You also run the risk of misjudging the playing field, he said. “If you show up knowing Billy’s the best, and you showed up ready to do better than him, then what if Sally shows up and Sally blows Billy out of the water?” Aiming for the best possible performance you can imagine is a far superior goal, he said. Think of what to do, not what to avoid. Telling yourself not to do something only focuses your attention on the very thing you want to avoid. “It’s like saying don’t think of an elephant — you immediately think of an elephant,” Nelsen said. Replace any negative injunctions with positive mental instructions. Instead of telling yourself not to look down, think about looking up. Rather than concentrating on not dragging your feet when you run, think of picking up your knees. “Nature abhors a vacuum. You have to replace your ‘don’t’s with powerful ‘do’s,” he said. Sell the story, not yourself. Rather than aiming to showcase your talents, allow your enthusiasm to infect the audience. You may want the audience to love you, but instead, Nelsen said, “make them an audience that loves what you love.” This requires a constant effort to stay focused on what you are doing, not how you are being perceived. “It’s about now. Now. Now. Stay in the present moment every second,” Nelsen said. Think of something you did right. After a performance, take a moment to note the things you did well, he said. “Don’t start out by thinking about all the things you did wrong. You have to have a low tolerance for destructive thinking,” he said. Once you have listed several things you liked about your performance, a process Nelsen called “strength-collecting,” then you can move on to critique and identify a few areas for improvement.